The Galaxy Note line has long been one of Samsung’s greatest assets in the mobile market. While other Android OEMs have made phablets before, Samsung was pretty much the first OEM to ship a high-end device in this segment. Although other Android OEMs have made phablets in the time since, Samsung continues to have a strong hold on this market. For Samsung, unlike previous iterations of the Note family, the Galaxy Note5/S6 edge+ represents a significant change in design compared to previous generations, integrating many of the design aspects of the Galaxy S6 across the whole family. 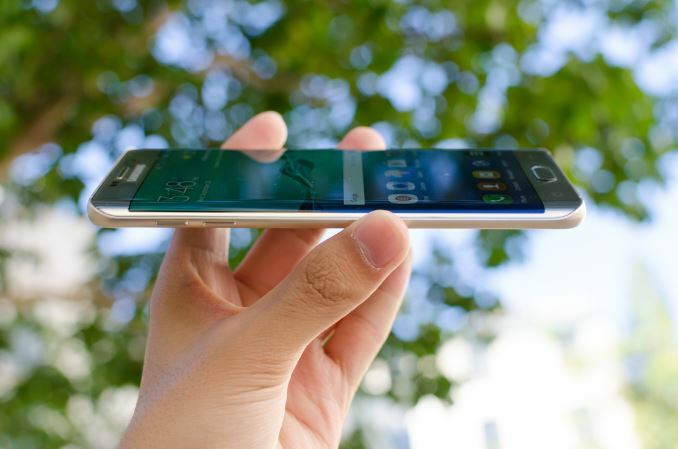 In many ways, the Galaxy Note5 resembles the Galaxy S6 in a different size. Meanwhile the Note5's companion device, the Galaxy S6 edge+, is effectively a second take on the Galaxy Note5, aiming for a design closer to a large format phone than a phablet as originially envisioned by Samsung. In this case the Galaxy S6 edge+ uses many of the design accents of the Galaxy S6 edge such as the curved display, all the while getting rid of the stylus. Probably the easiest way to start is by looking at the basic specs. In order to make this easier, the usual spec sheet is below. The Galaxy Note5/S6 edge+ and Galaxy S6 are definitely different in size - coming in at 5.1" versus 5.7" - but there’s otherwise a great deal of similarity this time around. The Galaxy Note5 shares a number of major components with the Galaxy S6, so the big differences between the two lines this generation will primarily be due to the S-Pen and larger size, along with an extra gigabyte of RAM. 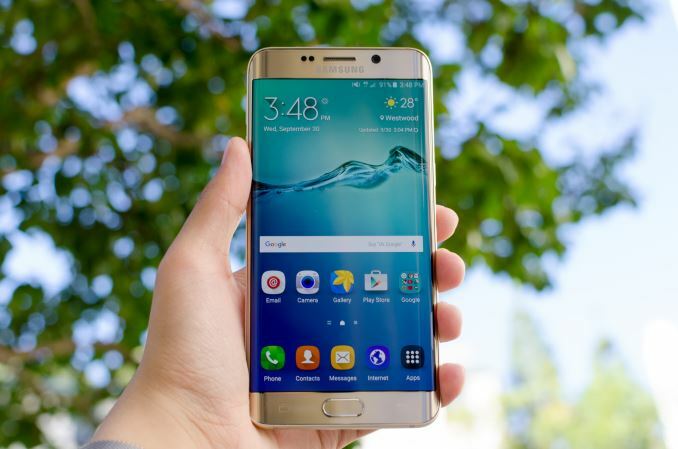 However, there are still some notable differences that are worth going over, as Samsung has been able to integrate a few months of lessons learned from the Galaxy S6 into the Galaxy Note5. The first, and easiest place to start is the design of this phone. If you’re familiar with the Galaxy S6, the Galaxy Note5/S6 edge+ is pretty much identical from a functional perspective. The front face of the phone has the same earpiece, home button, front-facing camera, and various sensors. Flanking the home button will be the two capacitive buttons, which are multitasking and back from left to right. The usual Samsung logo is on top, where the display driver for the display is. The bezel retains the same texture that it does from the Galaxy S6, which causes some interesting reflection effects, especially in the sun. The display also has noticeably thinner side bezels than what we saw on the Galaxy S6 or Galaxy Note 4, which is visually quite impressive but in the absence of palm rejection is pretty close to the limit of minimum bezel size. Along the side of the phone, the buttons, headphone jack, USB port, and speaker are all placed in the same places as the Galaxy S6, which should help if anyone is transitioning to the Galaxy Note5/S6 edge+ from the Galaxy S6. This means that the USB port is centered on the bottom of the phone, with the 3.5mm headset jack on the left side, and the speaker on the right. The volume buttons are also on the left side and are still as clicky and impressive as they were with the Galaxy S6, with no creep or mush and a clean break when the switch triggers. 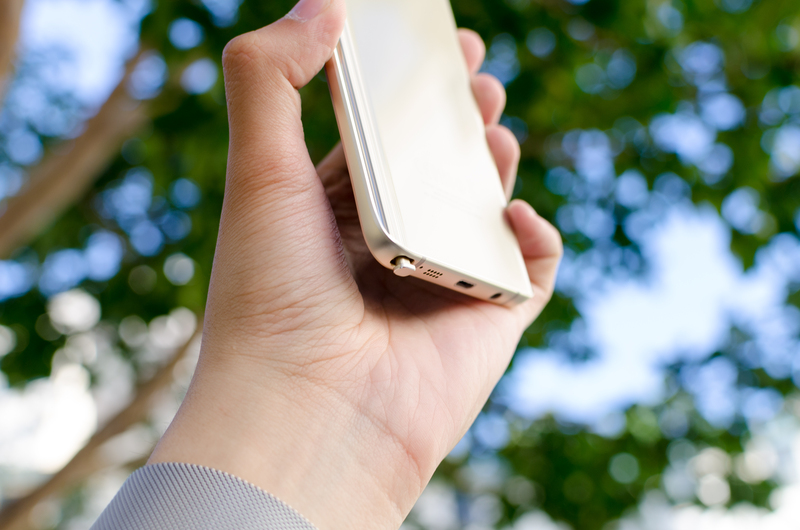 The power button is similar in feel and placed on the right side of the phone, high enough that you won’t accidentally activate the button when you’re picking up the phone. The top of the phone has the SIM slot for both variants this time around unlike the Galaxy S6, which had the SIM slot in a different position depending upon which variant you got. Unlike the Galaxy S6 or Galaxy Note 4, neither variant has a port for an IR LED/receiver for remote functionality. 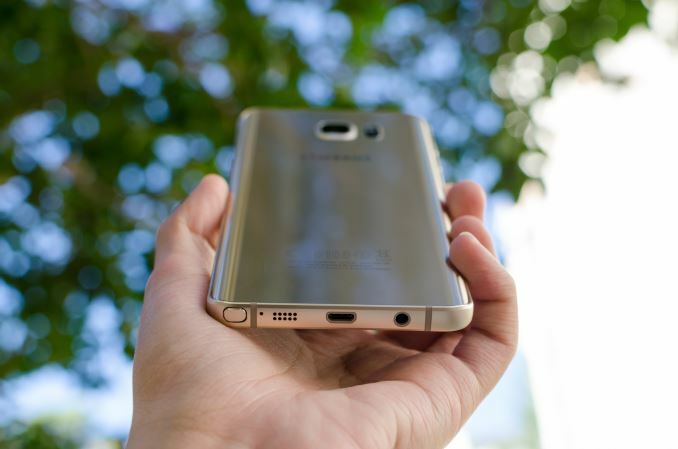 The Galaxy Note5 also adds a port for the stylus next to the speaker. Depending upon what phone you get, the major difference can end up being the shape of the back cover. While the Galaxy Note and Galaxy S6 both have glass for their back cover, the Galaxy Note5 has a 3D curved glass back cover much like the Xiaomi Mi Note line. This really improves the in-hand feel compared to the Galaxy S6, which felt a bit blocky. The Galaxy S6 edge+ retains the same flat back cover from the Galaxy S6, but feels a bit easier to grip than the Galaxy S6 edge which had an incredibly thin metal rail to hold on to. Both phablets will be fingerprint magnets on the back cover, but due to the use of glass it’s pretty easy to wipe off fingerprints unlike glossy plastic. Relative to the Galaxy Note 4, the changes are definitely notable. 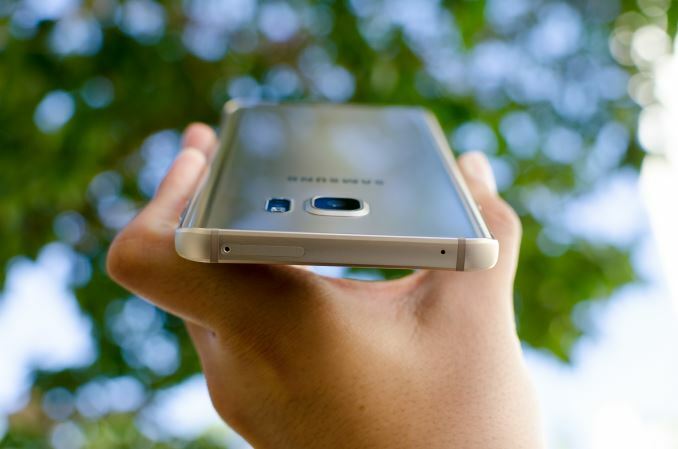 The metal frame of the Galaxy Note 4 was a relatively angular design, with flat sides and chamfered edges. This design made the phablet feel much bigger relative to something like the Note5 or S6 edge+, thanks in part to Samsung further reducing their device thickness with this latest iteration. The back cover of the Note 4 is faux-leather plastic that peels off much like the Galaxy S2's back cover, with a removable battery and microSD slot. The display has the same buttons, but the bezel had a striped design for unknown reasons. Some people might prefer the design of the Note 4, but I suspect most people are going to prefer the design of the Galaxy Note5. Overall, in the hand I’d still prefer the Galaxy Note5 to the Galaxy S6 edge+, but pretty much either phone has acceptable industrial and material design. I still wish Samsung would work on cleaning up the front of the phone to be a bit more cohesive, but for 2015 the design of the Galaxy Note5 and Galaxy S6 edge+ is actually quite good. Samsung has sought to distance itself from their reputation of Hyperglaze, and with this phone it’s pretty fair to say that they’ve achieved just that. Both phablets have no real ergonomic issues and are generally well-designed, although aesthetically there are some symmetry issues. Maybe I just don't use my phone enough, but typically at the end of the day I still have around 40-50% battery life on my iPhone 6. My previous device was a Moto G, which was supposedly great with battery life but it would die on me around dinner time even on a light use day. Both phones are good. But between the two, the Galaxy S6 Edge is way better receiving a higher review (see http://www.consumerrunner.com/top-10-best-phones/ for instance...) than S5.